Video clip synopsis – An artist and two drovers capture the beauty of 1200 head of cattle making their way across the outback in the last great Australian cattle drive. Broadband MP4 cattle_bb.mp4 (6.5MB), suitable for iPods and computer downloads. 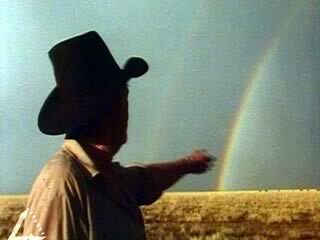 The Art of Cattle Droving is an excerpt from the film The Last Great Cattle Drive (58 mins), produced in 1988. The Last Great Cattle Drive: Australia’s last great cattle drive started in May 1988 with 1200 head of cattle on a journey from Newcastle Waters in the Northern Territory and ended 2000 km to the east in Longreach in September. This film is a tribute to the Australian drover and a celebration of the cattle drives that opened up the Territory and were a feature of outback life until the advent of road trains. The Last Great Cattle Drive was produced by Film Australia. The European occupation of the inland area of northern Australia was stimulated by the availability of cheap pasture in areas that could be used to raise cattle. While the land was often only able to sustain small numbers of head per hectare, the huge area of land meant that large numbers of cattle could be grazed. However, the cattle grazing areas were remote from markets and the cattle had to be driven over long distances to road or rail points and then transported to ports or slaughter yards. Aboriginal people provided the bulk of the labour used in the industry. This was because Aboriginal people saw this as a way of remaining in contact with their own country, the area where they were born, and also because cattle owners could not attract other workers to the area in any numbers. The Aboriginal workers, despite their skills, were paid very poorly, though support was given to their extended families to live in the area. In the 1970s the federal government ruled that Aboriginal stockmen were to be paid the full minimum wage. This greatly increased the cost of running the cattle stations, to the point where many became unable to survive. At the same time increased technological developments, such as the introduction of helicopters and trail bikes for mustering, reduced the number of people needed to drove cattle. In the video clip we see one of the last large musters and movement of cattle to market. Comment on the viewpoint expressed about the Australian Outback by the speakers in the video clip, and whether the style of the film itself supports this viewpoint through its selection of camera shots and background soundtrack music. Explain how cattle droving is presented as an “art” rather than merely hard work. From your impressions of the video clip’s contents, describe what you’d believe to be a “typical” Northern Territory drover in terms of character, appearance and mode of dress, and the implements and necessities of his trade (including reliance on animals). Explain whether you believe this is an accurate impression of the situation today, or whether changes have occurred over the years to alter the nature of droving and of drovers. In pairs research and write an informative magazine-style article on the importance over many decades of Indigenous Australian drovers in the Northern Territory (or in other regions of the country, if desired). Why were they relied upon to carry out the work, and why did they chose to carry out the work? Read the Background Information for this video clip, then carry out research and create a poster presentation about the political and economic gains of equity that Aboriginal stockmen made in the 1970s, and the long-term results of both these gains, including the modernisation of the entire profession. Write a poem, song or short story related to any issues from the previous activity. Present it orally to the class, or record and place it onto your school’s intranet as a sound file.